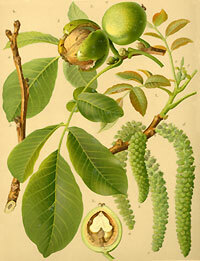 The true walnut grows as a tree, reaching a height of 10 to 25 metres. Male and female flowers are found on the same tree, the female blossoms standing in ears and the male ones hanging down as catkins. The flowers have a greenish colour. The round or oval fruits have a smooth green shell on the outside, which becomes brown and cracked as it ripens; the familiar nut is contained within. The walnut tree is generally cultivated in gardens, but it is also found wild in regions where the climate is mild. It needs a clay soil that is rich in chalk. Walnut shells are the outer carapace of the nut. These may be either the shells of the common walnut Juglans regia or those of the black walnut tree Juglans nigra. Both trees belong to the family of the Juglandaceae. The dyeing constituents of the still green walnut shells are pyrogallol and hydrojuglon. Pyrogallol in alkaline solution is oxidised to yield a brown dyestuff; hydrojuglon oxidises as soon as it is exposed to the air, and is mainly to be found in shells that have already been dried. Besides these naphthochinon colourants, walnut shells also contain tanning agents. Walnut shells are used to dye wool; a mordant does not necessarily have to be used. In former times walnut shells were used as a primer when dyeing stuffs black rather than blue. This was usually done in iron pots, where the iron ions changed the brown of the walnut shells in the direction of black. Dried, dark brown shells give a beautiful brown shade; fresh shells, on the other hand, should be marinated in water for at least 24 hours, so that a sufficient quantity of hydrojuglon can be converted to juglon.